Why do fans choose to attack other sports fans? Anybody who knows me knows my general attitude towards Boston sports. They know I can recite stats, facts, years, and history at the drop of a hat, and they know that I eat, sleep, and breathe Boston sports. Although I’m technically a “child of the 90s,” I’ve absorbed and memorized sports trivia to the point where it’s something of a running joke. I’m not sure if that classifies me as a “die hard fan,” but I’d like to think that I am. I can recite news from ESPN before I ever check politics, and every day is characterized by some sports event. I’ve lost sleep, been made sick, cried and cheered. I can guarantee one of my future kids will have the name Brady somewhere in their nomenclature. And, I’m not Christian, but if I was, I’d give merit to a debate that Rex Ryan is truly the Antichrist. More recently, Carl Crawford’s struggles at the plate have sent me into a tailspin, agonizing over why the hometown team sank so much money into a guy who is hitting under .150. But every now and then events happen that put things into perspective. I’m not talking on the worldwide level, such as the raging nuclear crisis in Japan. I’m talking more personal levels. Recently, the Red Sox first base coach, Ron Johnson, revealed that both the New York Yankees and the Boston Red Sox came together in a show of support when his daughter was going through a medical issue. I vaguely remember reading the article, and I remember how classy it was that the two teams supported him in that way. It’s stories like these, which put sports into perspective and that things transcend the game. These men are titans of their sport, but they are still men and at what point do we look at the game and decide that there is more to life? In late March, Bryan Stow, a fan of the San Francisco Giants who caught the Giants-Dodgers game at Dodger Stadium and was so brutally attacked in the parking lot outside the game that he currently remains in a medically induced coma. After the Opening Day game in Los Angeles, Stow was punched in the back of the head, rendered unconscious, and then beaten in a scene straight out of American History X. After being placed in a medically induced coma, he endured so many seizures that doctors chose to wean him out of it, only to have to place him back into it. The assailants reportedly fled in a sedan, accompanied by a woman and a 10-year old child. In the wake of this tragedy, the Dodgers and Giants came together, raising money for the family through the Bryan Stow Fund. It’s a great gesture, and it’s great to see teams come together in this show of support. But that doesn’t change what’s wrong about fans and what’s wrong about sports. And it certainly doesn’t change that this happened, and it doesn’t ease the Stow’s family pain. There are a few points that really trouble me about this story. First, the assailants reportedly had a child with them. That’s a great example to set. A grown man decides to beat another man for no reason in front of his child, just to unleash frustration over the Dodgers. If that part is true, then that perpetuates a cycle of violence, and it breeds a culture around sports that is contrary to everything sports reflects. Sports are about competition and the desire to win. As an adult role model, you get to look your child in the eyes every day and know that you’ve set this example. No matter what anybody tells the kid, he or she will always mimic what that role model does. Congratulations – you’ve set a great tone for that kid’s life. Secondly, and most importantly, is that this could’ve been avoided on so many levels, and it’s just so wrong that it happened in the first place. Everybody’s seen a fight in the stands at Fenway, most likely during a Red Sox-Yankees game. Now, I love the Red Sox, but to throw down in the stands just because someone’s opinion differs from mine? What’s the point? IT’S JUST A GAME! We kill ourselves as fans over what happens on the field, but we forget that these men are just men and that their day-to-day lives are, in effect, so far outside our realm that it shouldn’t do what it does to us. For those of us who are knights of the keyboard, it’s our job as journalists to make their lives our lives. But, at the end of the day, these men who play these games don’t answer to us, and they really don’t care. In the era of the free agency especially, these men are friends with people on other teams, teams that we hate with every fiber in our being. I mean, even the Ryan family is friendly with Bill Belichick, and I hate the New York Jets. I rooted for Brian Gionta as part of Boston College’s 2001 national championship hockey team, but now he makes me sick because he wears a Montreal Canadiens jersey. Does that mean I’m going to jump a fan in the parking lot and beat them to death? Absolutely not because there are more important things to worry about than spending $500 to go to a game (including tickets, beer, food, souvenirs, and God-knows-what-else they’re overcharging for at the stadium) and to let this control your life. It’s a fine line to walk as a fan. You have such passion, and that’s good. You want fans who are passionate instead of fair-weather, “pink hat” fans who name their pet after the Red Sox but have no idea who Adrian Gonzalez and Crawford are, (yes… I used to work with a girl who actually did that). But you want to do it within the context of what’s really important in your life. Is this really worth it? One of my favorite stories is about Mark Herzlich. Herzlich, the former Boston College football linebacker, is well-known for being a great athlete who missed the 2009 season with cancer. He fought his way back to the field and played the entire 2010 season and now is gearing up for a hopefully lengthy NFL career. Given my family’s history of dealing with cancer diagnoses, we feel a connection to the man. But in the context of the world, he doesn’t know who Dan Rubin is, (even though I hold out hope that one day I would get to meet him). And that’s for a positive of fighting and beating cancer, a story we can rally behind. I ask those fans in Los Angeles if what they did means something to the team’s season. I ask them if Matt Kemp knows who they were before this happened, and if beating up Brian Stow makes them better fans. I want to ask them if they feel like this will somehow help their team win. I want to know why they can’t show their faces. If they are proud of what they’ve done, beating up a Giants fan, why can’t they come forward and say as such? If they regret it, and they want forgiveness, why can’t they step forward and confess their guilt? Why are they the cowards they are? And what was the point? One thing’s for sure. The Boston Celtics and Boston Bruins will play in playoffs this week, and I’ll watch the game. I’ll cheer from my couch or from a bar, and I’ll yell and scream at the television. I’ll curse if they lose, and I’ll exhilarate if they win. But then I’ll wake up the next day, and I’ll go to work. I’ll call my girlfriend, my mom, my dad, and even my grandparents and I’ll tell them that I love them. Because at the end of the day, it’s only just a game, and there’s got to be something more than that. 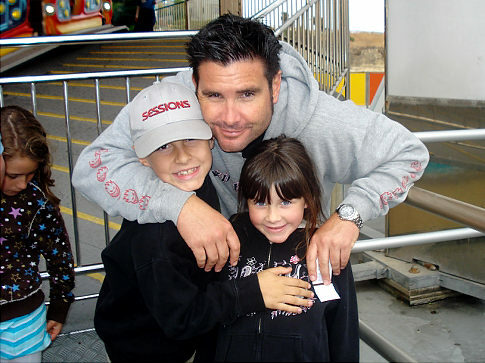 Anyone who wishes to donate to the “Bryan Stow Fund” can visit www.support4stow.blogspot.com or contact the San Francisco Police Credit Union c/o San Mateo Branch, 1495 S. El Camino Real, San Mateo, Calif. 94402.